← If This is the Best the NL Has To Offer, Sign Me Up For More Interleague. A Bad Night to Be Rodrigo Lopez. 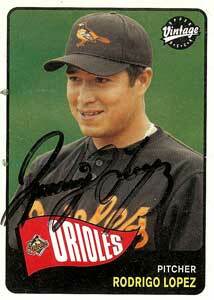 It's not a good thing when you look embarrassed to be wearing your team's cap on your own baseball card. Why? Because you used to play for the Orioles and now you play for the Diamondbacks. Of Course, that means it’s always a bad night to be Rodrigo Lopez. Another night, another game against a crappy NL Team. Keep it rolling.